Ingrid Divković: J..e li vas ego? Or, loosely translated into English, Is your ego fu..ing with you? I was at the book signing on Monday as I thought this might be an interesting book to read and after hearing the author say how it came about, I decided to get my copy and read it. It’s a fast read as it’s not a long book, and also, it’s not a self-help book. It’s more author’s musings on different situations that happened to her in life that made her realize how much she reacts from/with her ego than anything else. Something we can all relate to. I find it funny that I can say that Ingrid is still young (she’s 30) and you can tell from her writing she is young. I’m not that much older than she but it feels like I am, after reading the book.She still has that naive outlook at life (which I had for quite a while as well) and it shows in her writing. Not that I mind, I just find it funny that I look it that way now. For her first book, it’s amazingly interesting and full of thoughts that make so much sense from a female perspective. I might be prejudiced, but I somehow don’t think men would understand them as women do. And although the book suffers from some beginner mistakes (mostly the thoughts feel unfinished), it is still a book you read in one sitting because once you start you just go on. It also makes you feel good about yourself and leaves you with a positive outlook on your future. I really look forward to reading what Ingrid writes next because it’s rare to find a Croatian writer I like and think has so much potential. 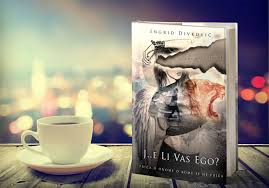 Tagged: Book review, Ingrid Divkovic, Is your ego fu..ing with you?, Je.. li vas ego?